TanDeck™ ULTIMATE MARINE DOCK BOARD is targeted for residential boat docks and private commercial marinas. Offered in two sizes - 1" x 6" and 2" x 6" which can span 16" and 24" respectively which satisfies "new build" and "refurbishing" projects. The proprietary design and formulation integrates a co-extruded cap layer which combines the highest quality additives to resist the harshest waterfront environments while maintaining its beauty for years to come. The inside or core of TanDeck is loaded with reinforcing fibers and other additives to complement the beauty on the outside with strength on the inside. This combination delivers unparalleled benefits of the longest lasting and most weather resistant marine dockboard in the market. TanDeck is sold exclusively through Tangent's network of certified Speciality Marine Dealers. For a complete list of TanDeck Dealers, please see RESIDENTIAL DOCKS & PIERS MARKET. Tangent is seeking to grow TanDeck's distribution network into additional territories. CONTACT US today if you are a dealer or lumberyard that services professional marine contractors located in waterfront locales to explore adding TanDeck to your product offering. TanDeck Territories are strictly defined and agreed to so there is no overlap of distribution. This allows our exclusive Dealer network to invest in TanDeck with confidence, knowing their hard work in promoting TanDeck will pay dividends for years to come. TanDeck™ ULTIMATE MARINE DOCK BOARD begins with purified blends of PCR Pure™, our signature 100% Post-Consumer Recycled HDPE Resin produced in house. We then combine proprietary strengthening fibers, UV–inhibited pigments, anti-oxidant processing aids and other additives for a highly stable material formulation that is superior to wood lumber and wood based composite plastic lumber to withstand the harshest marine environments. Structural characteristics similar to dimensional wood lumber but without the need to refinish yearly. Requires no waterproofing, staining or painting. Mold & mildew cannot penetrate surface and is easy to remove from the surface. Will not corrode, rot, splinter, or warp from repeated wet and dry cycles typical of wood lumber and wood based composites. Resistant to marine bores, insects or termite damage. Robust against harsh salt and fresh waterfront environments. UV-resistance increased by specially formulated additives. Wood grain embossed finish on surface for aesthetics and slip-resistance. Anti-stat additives to mitigate static discharge when seasonal humidity drops. Compatible with common woodworking tools, easy to cut, drill and rout. Easy to face screw — requires no pre-drilling for fasteners. Certified 50% Recycled Content minimum by independent third party audit. Certification yearly audit validates meeting FTC Green Guidelines. 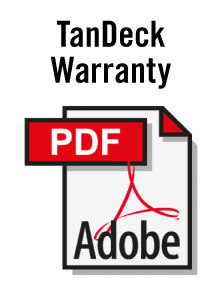 Backed by a limited 50-year warranty for residential installations. TanDeck™ ULTIMATE MARINE DOCK BOARD is targeted exclusively for waterfront residential boat docks and private commercial marinas. Intercoastal waterways, rivers, inland lakes and seaside coastlines regardless of salt or fresh water exposure represent perfect markets for TanDeck installations. Distribution of TanDeck is sold exclusively through Certified Speciality Marine Dealers and Marine Centric Lumberyards who cater to marine contractors that build and service waterfront boat docks, marinas and substructures. If you are a marine dealer or lumberyard looking to expand your product offerings in your waterfront territory, CONTACT US today. For more detailed information regarding TanDeck applications, installations and availability please see RESIDENTIAL DOCKS & PIERS MARKET. 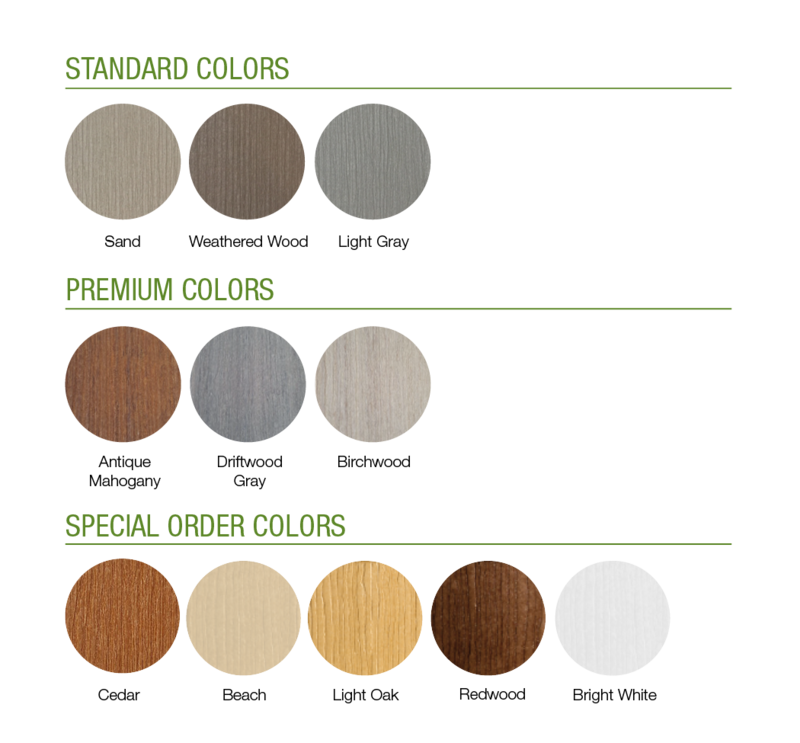 TanDeck™ is available in four color categories: STANDARD, PREMIUM, SPECIAL ORDER and CUSTOM. STANDARD colors (Sand, Weathered Wood and Light Gray) and PREMIUM colors (Antique Mahogany, Driftwood Gray and Birchwood) are typically stocked by our local TanDeck™ dealers. SPECIAL ORDER colors are typically not stocked, but available with a manufacturing lead-time and are non-returnable. CUSTOM colors can be matched depending on the scope of the requirement, are available with a manufacturing lead-time and are non-returnable. PREMIUM, SPECIAL ORDER and CUSTOM colors are sold at a premium over standard colors. Please contact your local TanDeck™ dealer for stocked colors, lengths and pricing. Designed With The End in Mind: Our product development team focused specifically to create "the ultimate marine dock board" to withstand the most harshest marine and waterfront environments while maintaining its beauty with minimal maintenance for years of enjoyment. Reinforcement: TanDeck begins with HDPE recycled plastic resin formulated with fiberglass filaments and other critical additives to create strength and durability on the inside to meet the functional needs expected. Co-extrusion: The visible outer layer or “cap” encases and protects the structural inside core and is comprised of the highest quality HDPE resins, pigments, UV resistant and anti-stat additives creating a superior external finish for beauty and function on all four sides of the dock board. Cross-sections: TanDeck is available in nominal 1"x6" and 2"x6" cross-sections. Surface cap layer and inside core are the same color looking natural and beautiful from any angle. Span: 1"x6" boards can span a maximum of 16” on center over the support joists; 2x6 boards can span up to a maximum of 24” on center over the support joists. Ideal for new and replacement projects. Length: TanDeck is typically stocked in 16’, 20’ and 24’ lengths, although inventories can vary by dealer. Large or specific projects requiring a special length can be custom produced at Tangent. Wood Grain Embossed Finish: Delicate and non-repeating wood grain to provide slip resistance and the beauty of a wood grain surface texture. Availability — Lead Times: All TanDeck Dealers decide which standard and regional colors plus lengths to inventory on their premises for servicing their unique territory and marine contractor base. Tangent as the manufacturer commits to keep back up stock on hand to replenish the dealers immediately so the end customer enjoys a quick install of their project with minimal delay. Wood Free: No wood or organic fibers in TanDeck. That means no wood for UV to fade, no wood for mold to penetrate, and no wood to absorb water, dry out, crack and warp. TanDeck's negligible moisture absorption equates to exceptional weather resistance and eliminates the typical maintenance issues associated with wood and/or organic fiber fillers. Quick Install: Simple install guide to follow. Easy to face screw with no pre-drilling needed for fasteners. Compatible with the CAMO Hidden Fastener System. Work with TanDeck like any other natural wood product. Easy to cut, drill and rout with no special tools needed. Recycled Content Important? : 50% Recycled Content minimum certified annually by Green Circle Certified, an independent 3rd party audit firm which verify's Tangent's environmental claims and assures our customers that we meet the Federal Trade Commission (FTC) Green Guidelines. Related Accessory Profiles: These are available in the same color as TanDeck to augment your project. Fascia board: 1/2" x 8"
Pile stripping: 1/2" x 1 1/2"
Corner posts: 4" x 4"
Cross bracing: 2" x 8", 2" x 10"
PLEASE NOTE: Stocking levels and lead time varies by Dealer. Proven Track Record: Seems like every year there are new "Alternative Composite Plastic Lumber" products entering the market. Some do well; many others disappoint. TanDeck began shipping in 2009 to South Florida which represents the most challenging outdoor environment. Six years later, TanDeck has a proven track record and is still growing and penetrating new territories. Specify and expand your business with confidence! Follow the links below to all documents associated with TanDeck™ ULTIMATE MARINE DOCK BOARD.